Oops - we don't appear to have a video for the Ngenuity 9125C. Armed with a bevy of little features that make a big difference for companies across industries, Ngenuity saves you valuable time and guarantees optimal image quality every time you scan. In addition to fast speeds, Ngenuity features smart paper handling and large feeder tray capacity to improve efficiency and ensure that you spend less time hassling with document preparation. SharpShooter™ camera technology and reliable LED lights team up to offer picture-perfect image quality and improve View InfoTrends Videoforms processing capabilities. Onboard image enhancement features further optimize image quality without sacrificing speed. 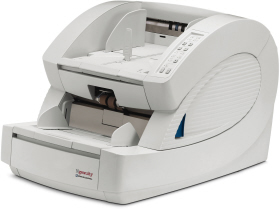 Ngenuity features long-lasting parts, a low cost of consumables and comes with everthing you need to start scanning. In other words, Ngenuity offers top value.